This soup is sweet due to the flavor of the sweetcorn, and can be served chilled or hot depending on the time of year. It is also a lovely partner to Black Bean Soup. They are both so easy to make, but serving them together side by side in the same bowl makes them good enough to present at a dinner party. The way to achieve the pretty, distinct shapes is to make one of the soups in a saucepan with a long handle, and put the other into a jug when it is ready to serve so that you can pour the soups from opposite sides of the bowl at the same time. 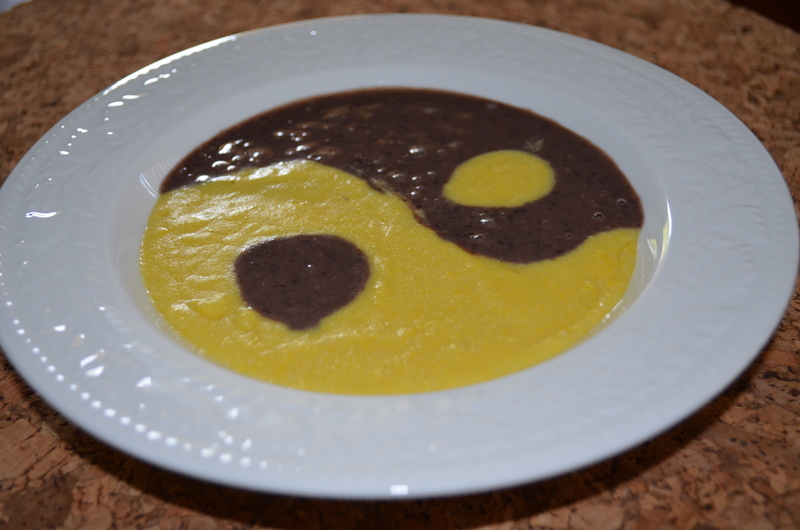 Ying/Yang designs can be achieved by pouring the soups in a clockwise (or anti-clockwise) direction for about 45 degrees. Cook the potato, either in a microwave according to manufacturer instructions, or boiled, or left over from a previous meal. Put everything together in a saucepan (excluding the cream cheez, if using), heat to simmering, blend with an immersion blender, sieve or put through a chinois if possible. Now add the cream cheez, if using, and reheat if necessary. I don’t think this needs any salt or pepper, but check anyway before serving.